Voice projection is quite essential to make a presentation or speech effective and impressive. If you have an important presentation chalked up, carrying along a powerful speaker could be a good idea in case you worry the sound system available at the presentation venue is not effective or loud enough to make your talk a success. However, it can be quite cumbersome and exhausting to bring the speaker besides your laptop, projector, microphone, etc. SMK-Link Electronics Corporation, one of the famous manufacturers for Microsoft PowerPoint presentation accessories, has tackled this practical inconvenience by introducing its GoSpeak! 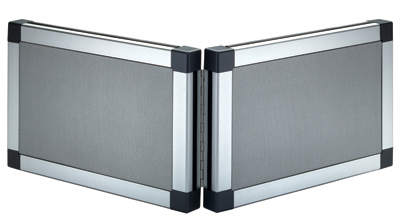 Pro Ultra-Portable Amplification System, a unique fold-out flat panel speaker. Weighing less than 5 pounds and utilizing NXT’s flat-panel speaker technology, users can easily keep this flat panel GoSpeak! Pro speaker in a laptop bag or a handbag and bring along for any event. Even though it is tiny in size, the unique speaker can deliver audio punch and clarity for gatherings of up to 200 people. The setting up and connection of this high performance audio system to the computer is pretty simple, fast and straightforward. With a suggested retail price of US $399.00 (or $499.00 with optional Audio-Technica Wireless Microphone System), users who frequently do presentations or deliver speeches, sales demonstrations, etc can consider investing in this complimentary accessory to make every presentation a success. Connections (Microphone #1: XLR and 1/4 inch) (Microphone #2: 1/8 inch), (line input: 1/8 inch mono), (line output: 1/8 inch stereo).